Polymeric electro-optic materials have recently been developed that, when fabricated into devices such as Mach-Zehnder interferometers, permit drive ( Vπ) voltages of less than 1 V to be realized at the telecommunications wavelength of 1.3 and 1.55 microns. Operation of polymeric electro-optic modulators to frequencies (bandwidths) of greater than 100 GHz has been demonstrated. The total insertion loss of polymeric electro-optic modulators has been reduced to values as low as 5 dB, which is competitive with values obtained for lithium niobate modulators and is much lower than that obtained for gallium arsenide electro-absorptive modulators. Polymeric electro-optic modulators can be operated for long periods of time at temperatures on the order of 100 °C. 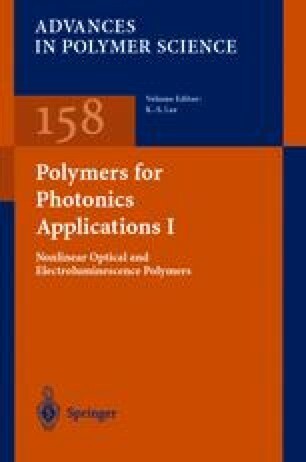 Techniques have been developed for seamlessly integrating polymeric electro-optic circuitry with passive low loss optical circuitry (e.g., silica long-haul transmission fiber and medium-range fluoropolymer fibers) and with very large scale integration (VLSI) semiconductor electronics. These advances have created a considerable interest in the commercialization of polymeric electrooptic materials. Polymeric electro-optic materials are now being evaluated for applications such as phased array radar, satellite and fiber telecommunications, cable television (CATV), optical gyroscopes, electronic counter measure (ECM) systems, backplane interconnects for high-speed computers, ultrafast (100 Gbit/s) analog-to-digital (A/D) converters, land mine detection, radio frequency (rf) photonics, and spatial light modulators. This review discusses the structure-function relationships that had to be defined and the synthesis and processing advances achieved before materials appropriate for commercialization could be produced. Topics discussed include the design and synthesis of chromophores that simultaneously exhibit large molecular hyperpolarizability, low optical absorption, processability (e.g., solubility in various processing media), and the prerequisite (thermal, chemical, electrochemical, and photochemical) stability to survive conditions encountered in the fabrication and operation of polymeric electro-optic devices. Chromophore-chromophore intermolecular electrostatic interactions have been shown to be the most serious problem impeding the optimization of electro-optic activity in organic materials. The quantitative theoretical treatment of such interactions by equilibrium and Monte Carlo statistical mechanical methods is discussed. Rules for designing chromophores with shapes leading to maximum obtainable electro-optic activity are discussed and the synthetic realization of such structures is reviewed. The role of electrostatic interactions in influencing the choice of processing conditions is also discussed. A number of processing steps, including spin casting, electric-field poling, lattice hardening, fabrication of buried channel waveguides (including deposition of cladding layers), electrode deposition and connection with electronic circuitry, and integration of active and passive optical circuitry, are required. Each of these steps can affect device performance (e.g., influence optical loss, electro-optic activity, and stability). The systematic optimization of each of these steps is reviewed. Finally, device design and operation are reviewed and speculation on the future of the field is expressed.